C Duff, 100 Renfield Street. 1930s. There has been a pub on this site since the 1870s, during this time Duncan Dow was landlord and lincesee. 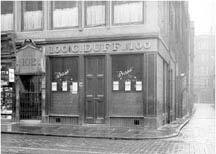 In 1892 Charles Duff acquired the licence, the pub was then known as the Century Vaults, this came about as a result of the address of the premises, and sat at the corner of Sauchiehall Lane. Charles when on to own another pub at the corner of Cleland Street and Thistle Street. When Charles passed away his wife Janet Lyle Duff took over the running of the business and became the new licensee. The pub closed down in the 1920s. After WW2 W W Connell & Son, gents outfitters occupied the sit.